Chaim Freedman – lecture to the Israel Genealogy Society, Jerusalem, February 2000. Tracing the family tree of the Gaon of Vilna, has long posed a challenge to genealogists due to the many difficulties encountered in validating the claims of families which hold an oral tradition of descent from the Gaon. Many families of Lithuanian origin preserve a tradition of descent from the Gaon, but the exact nature of many of their claims defies clear definition. Indeed, the apparent uncertainty of such claims has engendered amongst scholars and the general public an attitude of scepticism as to their authenticity, and an aura of legend has surrounded this perplexing puzzle. 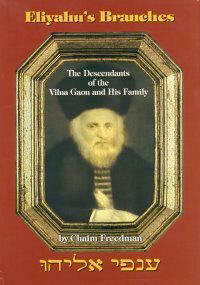 A number of attempts have been made in the past to research the family of the Gaon of Vilna. The most comprehensive published genealogy is "Sefer Hayakhas Lemishpakhat Rivlin Umishpakhat HaGaon miVilna " (the Genealogy of the Rivlin Family and the Family of the Gaon of Vilna) written by the late Eliezer Rivlin in Jerusalem in 1935. He recorded many branches of the Gaon's family that were known at the time. But Rivlin's work encompasses only 300 descendants of the Gaon . It should be noted that at the time when Rivlin conducted his research (prior to the Second World War) communication technology was limited, and the difficulty of exchange of information over closed borders limited the scope of the material Rivlin was able to collect. A mathematical extrapolation over the eight to ten generations that are descended from the Gaon can be shown to yield about 140,000 - 150,000 theoretical descendants. Even allowing for factors such as cousin marriages and considerable decimation during the Holocaust, the Gaon's family tree should potentially encompass a considerable number of families of Lithuanian origin. This author has been interested in the genealogy of the Gaon since his childhood when he heard his grandparents telling stories about their ancestors, including the Gaon of Vilna. The subject of the Gaon gained new momentum during a discussion which took place in Jerusalem between genealogist the late Rabbi Shmuel Gorr and Benyamin Rivlin, son of Eliezer Rivlin, the author of the above-mentioned original genealogy of the Gaon. Rivlin suggested to Gorr that he propose to Chaim Freedman that Freedman take upon himself the project of updating the Gaon's genealogy. This major research project was instigated in mid-1987. Its objective was to collate all available material about the Gaon's family and to publish an updated genealogy. The importance of pursuing this project was that it would provide the last opportunity to preserve oral traditions and link them to related archival material before the passage of time further eroded the genealogical memory base of oral traditions which were the key to research. Cross-reference by the author of seemingly independent family histories resulted in the discovery of long-standing missing links. Families which held traditions that, when considered individually failed to provide a basis for establishing their descent from the Gaon, yet when collated by the author, displayed a common denominator which led to the establishment of their relationship. Freedman's research involved the recording, analyzing and assessing of material provided by families claiming a relationship with the Gaon, as well as a comprehensive survey of library resources in Israel including community histories, newspapers, journals, rabbinic texts, biographies, manuscripts and published family histories. Additional material was provided from resource centres outside Israel by Freedman's genealogical colleagues. Notable New York genealogist, Alex Friedlander was of particular and constant help. He researched vital statistic records obtained from Polish and Lithuanian archives. The material collected by Freedman constitutes a valuable database for those interested in the Gaon's family. 1) Families which claim a relationship with the Gaon of Vilna that is definitely established by reliable sources and records. 2) Families which hold an oral tradition of a relationship with the Gaon that, when critically analysed in the light of sources and records, is, in the opinion of the author, highly likely to be valid, beyond any reasonable doubt. a) Families for which sufficient evidence exists for the author to decide to record the available information, for the purpose of preserving it in case further evidence is discovered in the future. Should such evidence be discovered, the inclusion of these families will facilitate a renewal of research, which may lead to the authentification of the families' relationship with the Gaon. b)Families which have provided information that, after analysis and research by the author, enabled him to come to the conclusion that, in his opinion, these families are most probably not related to the Gaon. The place of oral tradition in genealogical research is the subject of academic dispute. Modern genealogist have at their disposal many sources which were unavailable to their predecesors several decades ago. Modern computer and communication technology facilitate access to a wide range of depositories of sources. Documents preserved by archives throughout the world are becoming more readily accessible, particularly those documents which are held in libraries and archives in the former Soviet Union and neighbouring countries. Genealogists in the past have relied mainly on records kept by family members. These were supplemented by research in libraries and archives where communal and personal documentation may have been found. In the case of families of rabbinic descent, the religious literature provided considerable information about the familial relationships of the authors. Given the rapid advances in modern Jewish genealogical research, much of it based on newly uncovered vital statistic records (birth, marriage and death registrations), there is a tendency amongst researchers to play down the importance and validity of oral tradition.This author contends that oral tradition still has, and always will have a valuable place in Jewish genealogical research. A person usually is told by his parents, grandparents or other relatives about his family history.This is the first indication that a person receives about his family history and is derived from oral tradition. Documents may or may not be available to support this information, but in their absence it is the natural tendency of a person to initially accept what he has been told. If he is sufficiently interested, he may engage in research in order to validate the oral traditions and to expand the information which he may desire to preserve for the benefit of future generations. It cannot be denied that the indiscriminate use of oral tradition by genealogists has its pitfalls. It may be embellished in order to aggrandise past generations. Distasteful information may be suppressed. When oral information is repeated it may not be recalled accurately, or it may be distorted due to insufficient attention paid when the information was conveyed. These distortions and inaccuracies may be perpetuated when the information is passed on to subsequent generations. In extreme cases information may even have been fabricated. In assessing the validity of oral tradition it is important to analyse the terms in which it was conveyed. In particular it is important to know whether the information was conveyed spontaneously without any leading questions which may have put into the mind of the person being questioned ideas which were not part of the original information. However, with respect to certain factors, it is valid to ask leading questions. For instance, a parent or grandparent may not recall the name of an ancestor when asked for the name directly. Yet, if the question is rephrased in terms of after whom the parent was named, he may then recall that he was told that he was named after a certain greatgrandparent. Such oral information may then lead to a new line of research. The greater the number of generations removed from a particular ancestor being sought, the more likelihood there is of discrepancy in oral tradition. If one is told that one's grandfather claimed that his grandfather was a fourth generation descendant of the Gaon then there are thirty-two possible lines of descent from the Gaon. There may be additional information, such as place of residence or dates of birth which may reduce the possibilities. But the number of ancestral lines which need to be researched is still very large. If the link is not discovered in the current generation and the story is passed on to yet another generation, members of that generation have to cope with a bigger puzzle in which the number of possibilities soars to sixty-four. This simple calculation further justifies the author's decision to record all reasonable oral traditions in his book on the family of the Gaon of Vilna, in order to assist the coming generations should they try to uncover the `missing link'. Oral tradition and documented sources complement each other in pursuing lines of research.A competent genealogist takes into account all the above factors in considering the validity of oral tradition, uses the available documented sources, and comes to a conclusion which is valid beyond a reasonable doubt. Since this book deals with one of the most prominent personalities of Jewish scholarship, it is fitting that a principle established in traditional Jewish law be used to support the case for the use of oral tradition. Jewish law defines the forms of evidence required in solving a dispute brought before a Beth Din. Considerable material exists in the Talmud and in its commentaries about the need for conclusive evidence being presented to prove cases brought to litigation. The late Rabbi Shmuel Gorr of Jerusalem, a prominent genealogist, used to expound the Talmudic principle ( (זבחים פרק י"ד, משנה ד'that the assertion: "I have not seen it", that is no evidence (to the contrary). He explained that simply because documented evidence may not have been discovered does not mean that the evidence does not exist, or that the point claimed to be valid must be disregarded. This was one of Rabbi Gorr's favourite quotations whenever the value of oral tradition was denigrated. In his book on the family of the Gaon of Vilna the author exhaustively sought documented evidence to establish the genealogy of the families included. Oral tradition has been objectively considered. In many cases the author has consulted genealogical colleagues and taken into consideration their opinions.The conclusions presented are those of the author based on his expertise and experience in Jewish genealogical research. The difficulties that have been encountered over the years in tracing the descendants of the Gaon are surprising, considering that only 200 years have elapsed since his death in 1797. Only about eight generations have been born since that time . At the time Freedman started his research in the early 1960's, there were people alive who had heard stories about their descent from the Gaon from their grandparents (born in the 1830's) who were grandchildren of the Gaon's grandchildren (born in the 1780's). Such a chain of oral tradition was not so extended as to preclude the preservation of far more oral traditions than were in fact discovered. There are several reasons for the difficulties encountered in researching the Gaon's family. Official records of births marriages and deaths were kept by a law instituted in the Russian Empire only in the early 19th century, except for communal lists which were compiled several times during the 18th century. Since all of the Gaon's children and most of his grandchildren were born prior to this date, there were few official records which could confirm their identity. It was not until the commemorative activities which took place in Vilna in 1997 to mark the 200th anniversary of the Gaon’s death that the census of 1765 was revealed. Study of the family unit of the Gaon made it possible to confirm the relative age of the Gaon’s sons as proposed in my book. Later the census lists for 1784 and 1795 added to the overall picture. It is a characteristic of Lithuanian families to play down their Yichus (pedigree). One example of this phenomenon was encountered when Freedman contacted an elderly rabbi living in Jerusalem. He was reluctant to discuss the issue, but grudgingly related what his mother had heard from her mother about their descent from the Gaon. But he soon cut the conversation short retorting: "What does it matter. Such research is Bitul Torah". He was expressing the sentiment of which the Gaon himself was a renowned proponent. One is obligated to spend as much time as possible in the study of the religious texts. The only time which can be justifiably used for other purposes is that needed to earn a mimimal livelhood. Even time required to attend to family affairs is begrudged. There are several stories related about the Gaon's disinterest in his children's everyday activities, despite his love for them. In the light of this attitude it is no wonder that orthodox Lithuanian families spent little time telling their children about their family history. Thus, much information was forgotten with the passage of time. One oral tradition conveyed to this author related that an elderly relative in Vilna had possessed a book in which the Gaon himself had recorded his genealogy. Bearing in mind the Gaon's personality and relationship with his family, this story was obviously fictitious, or at best, an embellishment of some other book in the family's possession. Wars and pogroms which plagued Europe over the last 200 years destroyed many records. Jewish cemeteries have been severely damaged or obliterated in many towns in which the Jewish population was decimated by the Holocaust. The loss of six million Jews during the Holocaust severed what might have been a continuation of the passage of oral traditions. Mass emigration of Jews from the age old cradles of their family origins in Europe to the `New World' in North and South America, England, Australia, South Africa and Israel severed the natural contact between the generations. A new generation grew up, cut off from contact with its grandparents. Immigrant parents were all too anxious to forget about the Diaspora and its often sad and harsh history. It is no wonder that genealogical information was not passed on. Information useful to genealogists is often found in old Hebrew prayer books, bibles or other religious texts. It was the custom in traditional families to record names of relatives and their dates of death in such books and pass them on to the ensuing generations. When young couples emigrated, these books usually remained with their parents, since they were still in use. Only if the parents or grandparents had already died at the time of their family's emigration might such books be taken with the emigrants, if they valued them. Photographs are also useful in establishing genealogical details. But people often are negligent in not writing the names of the subject of the photograph on the back. When these photographs are passed on to the next generation, the identity of the relatives depicted is often unknown. Sometimes, such photographs can lead to completely erroneous conclusions. This author was presented with an album of photographs collected by an elderly relative. Some were inscribed on the back, and others were identified by elderly relatives still alive. One photograph was the subject of much conjecture until the author examined the Russian inscription. It was a photograph of the famous Russian writer, Leo Tolstoy, obviously not a relative at all ! Because the Gaon of Vilna was such a prominent figure in Jewish scholarship, descent from him was considered to be particularly worthy of honour. Some people may have been embarrassed to publicise stories told by their parents about their descent lest they be thought to be boasting. Descent from the Gaon also carried with it a responsibility to live up to his standards of behaviour, particularly in religious matters. Perhaps people who no longer were religiously observant considered descent from the Gaon an onerous burden.Yet, ironically, many non-observant people take great pride in their descent from the Gaon and preserve the oral traditions conveyed to them. The term `Gaon' was quite sparingly used during the time of the Gaon of Vilna. Over the ensuing generations it has been rather liberally ascribed to rabbinic scholars as a term of honour. This may result in a person being told that he was descended from `the Gaon' yet the term may refer to another rabbi who was known by that title. The families Elion and Jodaikin held a tradition of descent from the "Gaon Eliyahu" and believed therefore that their ancestor was the Gaon of Vilna. Two factors led to the confusion. The families were in fact descended from a famous rabbi who was often referred to as a "Gaon". He was Rabbi Eliyahu Luntz (or Rabbinowitz) of Krozhe. Furthermore, this Eliyahu was a brother-in-law of the Gaon of Vilna whose second wife was Luntz's sister. The coicidence of these two factors led the above families to believe that they were descended from Eliyahu, the Gaon of Vilna. An extreme example of confusion between rabbinic personalities arose when the author was informed by a certain family of it's descent from the Gaon of Vilna. Unable to discover the link, the author's problem was solved when his contact apologised profusely. The ancestor was actually Rabbi Shneour Zalmen of Liadi, ironically the Gaon's rival ! Genealogies of rabbinic families often omitted sons or sons-in-law who were not scholars. Similarly, daughters were often not recorded in such families. The Gaon's son Rabbi Yehudah Leib of Serhei, Lithuania is recorded in Rivlin's work as the father of only two daughters. This author has discovered that Yehudah Leib had at least six daughters. Certain families, known to be descended from the Gaon, simply refuse to publish their family tree, for a number of personal reasons. This is regrettable, since their non-inclusion in this present book may lead to the impression, in the future, that such people are really not descended from the Gaon. A prominent rabbinic family in Israel is known to have about 500 living descendants, yet the family refuses to record their names. Siblings born to a mutual father often used different surnames to each other and to that borne by their parents. This practice was prevalent in the Tsarist Empire, and was a ploy used to confuse the military authorities. The notoriously anti-Semitic practices of the Tsarist army resulted in male Jews using this surname change as a means of evading conscription. Such variation of surnames within the one family leads to confusion in genealogical research. For example, one of the Gaon's daughters, Khiena, the wife of Rabbi Moshe of Pinsk, bore eight sons who used the surname Chinitz, one whose surname is unclear, but whose descendants used the name Lipshitz and Neches. Certain families claim that one of Khiena's sons used the surname Penchuk and yet another, Landau. Each of these claims had to be carefully analysed by the author, and some remain unverified. Some historians and genealogists who are not fluent in Hebrew have used, as the basis of their research, sources translated from Hebrew to English. These second-hand sources are prone to errors. Similarly, members of families which claim descent from the Gaon of Vilna, have been assisted in their research by incompetent translators, who are not familiar with the genealogical nuances of sources. One researcher went to the trouble of having Rivlin's work translated into English. This led to confusion between a descendant of the Gaon's brother who lived in the town of Eiragola, Lithuania, or Ragoler to the Jews, with a certain person who live in a place called Raguva. The researcher conveniently merged the two personalities and added to his family tree hundreds of people who had no place on it. The Gaon was married twice. The first wife was Khana, daughter of Yehudah Leib of Keidan. After Khana's death in 1782, the Gaon remarried a widow Gittel, daughter of Rabbi Meir Luntz (born 1709) of Krozhe, Lithuania. The fact that the Gaon was married twice has caused considerable confusion. There are families that held a tradition of descent from the Gaon's second wife, Gittel. Since the sources on her family clearly establish that Gittel bore no children to the Gaon, then families descended from Gittel are descended from her first husband, and not from the Gaon. A major error made by a certain researcher arose from the Gaon's second marriage. Knowing that the Gaon was a brother-in-law to Rabbi Yekhezkel Luntz of Shavli, the researcher assumed that the connection was through Luntz's wife Malka. The researcher drew up a family tree of the Gaon's family and included all of the descendants of Yekhezkel Luntz as descendants of the Gaon's hypothetical sister, Malka. If the researcher had been conversant with Hebrew sources, he would have been able to read a book written by a grandson of Luntz, the contents of which make it clear that there was no such descent. The Gaon was a brother-in-law of Luntz, not through a hypothetical sister, but due to the fact that Luntz's sister Gittel was the Gaon's second wife. Certain families have believed that they were descended from the Gaon. After investigation however, it becomes clear that they were descended either from the brothers of the Gaon, or from one of his students. Terminology used to refer to relationships is misleading. "‏Of the family of the Gaon of Vilna‏" may mean actual descent, but more often the term refers to the descendants of the Gaon's siblings, or even may refer to more further removed connections by marriage without an actual blood relationship. A prominent family that settled in Jerusalem 140 years ago maintained steadfastly it was descended from a daughter of the Gaon. This author failed to identify the relevant daughter, despite considerable research by members of the family. Recently new material came to light. A letter written about 1855 by a Lithuanian rabbi records a match arranged between his son and a daughter of the above family in Jerusalem. Of immense genealogical value was a statement by the writer of the letter giving details of the descent of the bridegroom from a sister of the Gaon. At last the puzzle had been solved. One of the Gaon's ancestors, Rabbi Moshe Kremer, who was chief rabbi of Vilna in the seventeenth century, was known as "Kremer", meaning shopkeeper, since his wife operated a stall in the market. The appelation "Kremer" was not a surname. Indeed most Jews in the Russian Empire only acquired surnames at the beginning of the nineteeth century. Yet many families bearing the name Kramer or Kremer erroneously believe that they are descended from the Gaon of Vilna. (Some are descended from a brother of the Gaon whose descendants did adopt the name Kremer). Likewise a widely ramified Galician family believe that they are descended from the Gaon, simply because they bear the surname Wilner. An important means of disproving certain oral traditions is often a simple arithmetic calculation. Members of a certain Kossowsky family, whilst probably genuinely descended from the Gaon, instilled doubt in the mind of the author when they claimed that an ancestor recalled sitting on the knee of the Gaon, who, it was claimed, was her grandfather. Since the Gaon died in 1797, and since the ancestor was born in 1826, this incident could not possibly have occurred. On rechecking the source of the story, it was found that the incident occurred a generation earlier, which brought the event within a feasible time frame. The Kantorovitch family of Jerusalem, whose claims to descent from the Gaon are most likely valid for other reasons, recorded certain events which cannot have occured in the way they were stated. It was claimed that the Gaon's youngest son Avraham wrote a letter to a grandson, Yaakov Koppel Kantorovitch, congratulating Kantorovitch on the completion of his studies and on obtaining Semikha (rabbinic ordination). Since Avraham died in 1808 at the age of 44, it is not likely that he had grandson of a suitable age to have obtained Semikha during his lifetime. It is claimed that the Gaon's daughter Khiena had a son "Haskell Landau" whose daughter married a Remigolsky. This author's research identified the relevant Remigolsky. Yet details of Remigolsky's son in a rabbinic encyclopedia, whilst recording his emminent rabbinic ancestors, fail to record descent from the Gaon of Vilna. This omission renders the family tradition highly suspect. A common source of confusion in oral traditions is the assumption that if one's cousin is descended from the Gaon of Vilna, so must one also be. This author attended a family reunion at which various sides of his family were represented. He had to repeatedly correct the impression held by one side of his family that they were descendants of the Gaon, like the majority of their cousins attending the reunion. It has been this author's fortunate experience that he was able to verify many valid oral traditions of descent from the Gaon of Vilna. One example was discovered in Australia where a family which had settled there in 1854, still maintained an oral tradition of decent from the Gaon. Much effort was expended in researching this family which resulted in the discovery of a photograph of the tombstone of the original member of the family who settled in Australia. Although the tombstone was no longer standing, a photograph preserved by the Australian Jewish Historical Society revealed that the person in question was actually a grandson of the Gaon. Details of the inscription correlated with oral traditions held by another family living in England. Thus, this author was able to solve the links of several families, hitherto unknown to each other, yet each holding the same tradition. Many were such success stories and the author continues to hope that other missing links, recorded in his forthcoming book, will one day be resolved.